Balmain tortoiseshell acetate sunglasses. Oversized cat-eye frames with metal bridge. Thin, tapered arms with metal detail at temples. 100% UVA/UVB protection. Made in France. Fall and booties go together like spring and florals, and we couldn't be more excited to grab all the new styles now that the leaves are falling and the temperatures are dropping. Whether it's your oversized sweater and leggings getup or a denim-on-denim ensemble—there's no fall outfit a bootie can't complete. For your next summer soiree, instead of worrying about your outfit, why don't you opt for a killer sunglass and lipstick pairing? Shop a few of our favorites here. 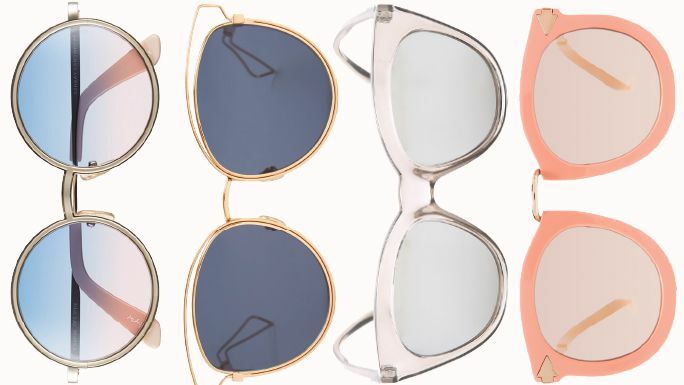 See the affordable sunglasses Jennifer Lopez can't get enough of. Never regret another purchase. Find out which iconic sunglasses are worth the money here. Shop the fun trend that all of the stars are already wearing. Pared Eyewear Tortoiseshell Acetate Cat-eye Sunglasses - Composition: Acetate, Brass. Made in the USA. Gucci tortoiseshell acetate sunglasses. Oversized round frames. Thin, tapered frames. 100% UVA/UVB protection. Tom Ford tortoiseshell acetate sunglasses. Oversized cat-eye frames. Wide, tapered arms. 100% UVA/UVB protection. Made in Italy. Coach acetate sunglasses. Oversized cat-eye frames. Wide, tapered arms with logo detail at temples. 100% UVA/UVB protection.